When nonstick pans first came into the market, they were made of very fragile materials. They were only good for frying eggs. This meant that nonstick pans had a very limited use. Fortunately, nonstick materials evolved. This has made nonstick fry pans to have a versatile use. If you buy the best nonstick pan, you will be able to use it to cook almost anything. You can use it in your oven to sear meat and to get browning on vegetables. What makes nonstick fry pans to be the most preferred types of pans is because food does not stick to their surfaces. This is means that nonstick fry pans will give you a cooking experience like no other since food does not burn while you are cooking on them. Cleaning your nonstick pan is also easy since you will not be struggling with tough food residues and grease. Here are the ten best nonstick fry pans that we have reviewed for you. You will, therefore, have an easy time getting the best nonstick fry pan since you won’t have to go through tons of reviews to choose the best. 2 Why Should You Buy Nonstick Pans? T-fal is a company that has a good reputation for making quality cookware since 1954. It features a TechnoResist base to prevent warping. The base is also made of hard anodized aluminum to make it extremely durable. Its unique Thermo-Spot technology will let you know when you should start cooking. When using this pan, your comfort and safety are guaranteed since its silicon handles are attached with rivets and will remain cool no matter how long you have put the pan on fire. You can also safely use it in an oven in temperatures of up to 400-degrees F. Its glass lids are easy to grasp as they also come with their hold handles. 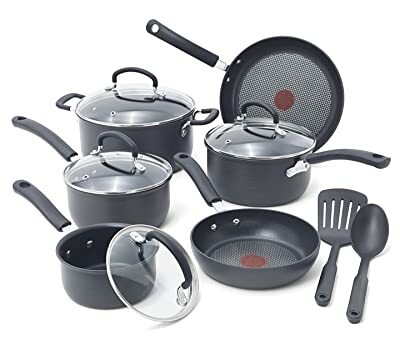 If you buy this 12 piece set, you will get two frypans that are 8 and 10.25 inches, a quart covered Dutch oven that is 5.6 inches and three different quarts covered sauce and sauté pans. And what’s the best part? You will also receive a solid spoon and a nylon slotted spatula that you can use to serve and prepare your food. The set weighs 20 pounds. The set also comes with a Lifetime Limited Warranty and a User’s Manual. Unique T-fal Thermo-spot heat indicator. It is safe for use with metal utensils since it is scratch resistant. Gives optimal cooking results due to its exceptional heat distribution. You can use it for all cooking methods except induction. Its handles are comfortable because of their ergonomic shape. It’s heavier as compared to other pans. Some foods may stick on them. If cooking is your passion, then your preferred cookware should be All-Clad 4110 NS R2 Non-Stick Fry Pan. This cookware is manufactured by All-Clad Metalcrafters, a cookware company that is known for making top tier products that can meet the changing needs of people who demand uncompromised quality in their kitchen. The All-Clad 4110 NS R2 Non-Stick Fry Pan features a stainless steel bottom and has a non-stick coating on top that is PFOA-free. This fry pan is a true kitchen staple and is ideal for browning, searing, and pan-frying almost everything from eggs to meat. With its flat bottom and flared sides, you will enjoy cooking as you will be able to easily turn your food with a spatula and effortlessly toss your food. Its thick-gauge aluminum core attracts heat fast and ensures that heat is evenly distributed to give you consistent results across your entire cooking surface. This fry pan is also dishwasher-safe and is warp-resistant. It is one of the most versatile cookware as it can be used on any cooktop. This means that you can even use it on an induction cooktop. Suitable for different cooking styles. Is highly durable since it is constructed of aluminum and stainless steel. Offers better cooking experience due to its efficient heat distribution. You can use it on any cooking top. Suitable for both novice and expert cooks. You will cook with less oil since its interior is made of a nonstick coating. Its surface is also easy to clean. It is not oven safe. Gotham Steel cookware is the best option for you if you are looking for a nonstick pan that has no Teflon. This pan will give you the best cooking experience since it is easy to maneuver due to its lightweight. You can safely use the pans both in an oven or microwave. This is because the pans can manage temperatures of up to 500 degrees Celsius. The surfaces of the pans are nonstick and scratchproof as well because of the Ticerema coating on the pans surfaces. If you buy one set of this cookware, you will get 10 pieces in it. The set includes two saucepans that are 1-5 quarts and 2.5 quarts each. You will also get two round pans that are 8.5 and 10.5 inch pans. The set also contains with four tempered glass lids that you can use to cover your food so it can cook more quickly as the lids will create a tight seal. The last piece is a five-quart pot that you can use to prepare your soup and stew. Weighs less as compared to other frying pans. Cleaning these pots is a breeze. Their handles have a stay-cool design making it easy to transfer food. The tempered glass lids won’t crack or snap. Due to their nonstick surfaces, you can cook in them without using any oil, butter or seasoning. Food may begin to stick after prolonged use. Are you a fan of frying eggs? If so, then this Calphalon Contemporary cookware is just what you need to add to your cookware. This 8-inch skillet is versatile in terms of what you can cook on it, from frying eggs, cooking breakfast sausage and sauté vegetables. This fry pan features a stylish and modern design that will look great in your kitchen. The thick flat bottom of the pan and its gently sloping sides will give you an easy cooking experience. It evenly distributes heat due to its hard-anodized aluminum construction. Cleaning it is very easy because of its nonstick surface that ensures food does not stick. It can handle temperatures of up to 450 degrees Fahrenheit making it suitable for use in an oven. Stylish and durable nonstick fry pan. Long brushed stainless steel handle. Thick flat bottom with sloping sides. It is a versatile fry pan that is suitable for everyday cooking. It’s very easy to clean due to its nonstick surface. You can also clean it in your dishwasher. Has a durable triple layer that makes it last longer. It conducts heat very well. It is lightweight than most fry pans. Its size makes it perfect for cooking small meals. Food tends to stick around the metal rivets that connect the handle to the pan. The Ecolution fry pan is a medium thickness pan that is made of aluminum and edges itself above the rest of nonstick fry pans with its unique coating. Its nonstick coating ensures that food does not stick on its surface whenever you are cooking. It uses a water-based coating that is non-toxic. This encourages healthy cooking. This product comes with a large handle that is silicone coated. This silicone coated handle stays cool no matter how long the pan is on the stovetop. However, when you put the pan in an oven, the handles do heat up. You can use this fry pan to cook in an oven, on a gas or on an electric stove. It has a bottom that is designed to efficiently distribute heat on its surface so that food can cook uniformly. In terms of durability, the Evolve cookware is designed to last for years since it is made of heavy gauge aluminum. The pan is also dishwasher safe to make it easy for you to clean it. Its lightweight design makes it easier to maneuver while you are cooking. The ergonomic design of its silicone handle makes it comfortable to use. Its color makes it look attractive in the kitchen. It is truly nonstick, making it perfect for eggs and pancakes. It heats up a lot faster. Avoid using metal utensils while cooking on this pan as its surface can be easily scratched. Le Creuset fry pan is one of the versatile nonstick ranges of pans that can make your everyday cooking easier. It has several features that make it perfect for your cookware portfolio. One of such features is that it is crafted from high-quality hard anodized forged aluminum. It is also toughened both inside and outside with a non-stick coating that is superior. Its non-stick surface and its special hardened body ensure that the pan stays durable so you can use it to cook for many years. Due to its nonstick interior, cooking is made easier as you can easily cook with little or no oil giving you a healthier result. It has professional style handles that are attached to it using stainless rivets. This makes the handles to be secure and durable. The handles stay cool even if the pan is on the hob for a long period to enable you cook with a lot of ease and comfort. Nonstick and PFOA free surface. Magnetic stainless steel disk that resists erosion. Quick-heating due to its hard-anodized fully encapsulated aluminum core. Completely multifunctional since you can use it under any boiler or with any stove top. Comes with a tempered glass lid that is sold separately. This lid retains moisture and flavor. You can use metal utensils on the surface. Can be used in an oven since it can handle temperatures of up to 260 degrees Celsius. The pan retains heat to facilitate oven to table serving. Can be used on any hob, including induction hob. The glass lid is heat resistant. Comes with a lifetime guarantee for long-term economy. The nonstick surface lasts twice as long as other nonstick pans. After wear and tear, it loses its non-stick property. Contemporary Aluminum Nonstick Pan is the best product from the Calphalon manufactures that you can consider bringing to your kitchen. This Pan has been perfectly constructed using a heavy gauge aluminum material which ensures that it lasts longer while heating evenly as well. Its hard design makes it safer when you use a dishwasher for cleaning. 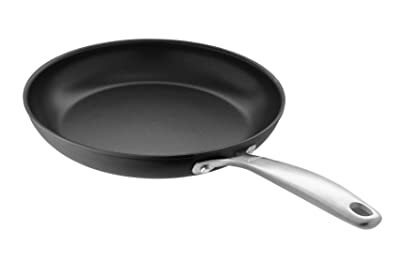 With this kind of pan in your home, you will be the happiest and proudest person to be in the kitchen. Why? Your health is fully guaranteed by the fact that you will only be required to use less fat while doing your cooking on this amazing stuff. Its sliding surface clearly indicates that you won’t be struggling with food stacking aimlessly on it hence an effortless cleanup is fully witnessed. Another plus for the Calphalon Nonstick Pan is a lifetime warranty which is fully guaranteed. Isn’t that amazing as you will own a durable product that will make your kitchen the heart of your home? It also has stainless steel and long handles that have been well designed to be cool all through your cooking session. Besides, its cover is also proven to be oven safe. Calphalon Nonstick Pan has been greatly fitted with three layers such that the first two layers are for maximum durability whereas the third layer ensures smooth release performance. Additionally, its wide, flat bottom provides an excellent room and proper heat distribution during cooking. Are you looking for a frying pan for your restaurant? Well, the best option for you would be the Tramontina 80114/535DS nonstick restaurant fry pan. This fry pan comes in several sizes. 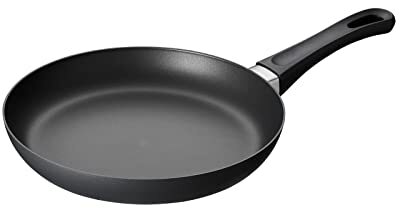 Just from its name, you will know that this frying pan is designed to withstand the high degree of use that is associated with commercial kitchens. Whether you want to saute, scramble, sear or fry any food, be rest assured that the Tramontina fry pan is well suited for your kitchen. Its heavy gauge aluminum construction ensures that heat is distributed evenly and quickly on the frying pan. This will ensure that your food cooks evenly. 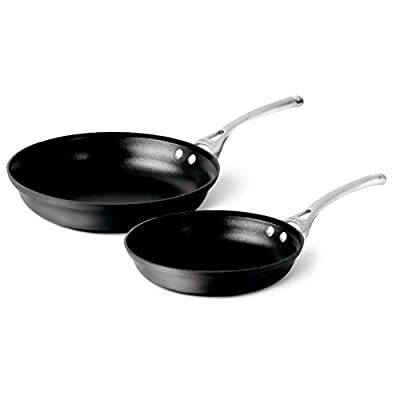 Its nonstick properties are achieved due to its reinforced interior coating that is PFOA-free. 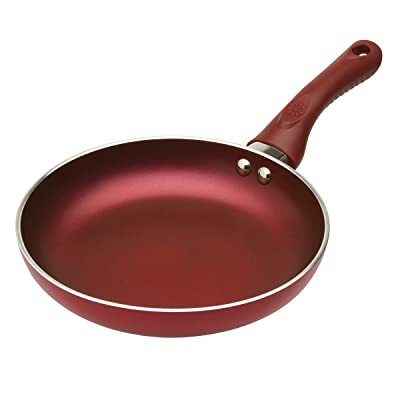 The interior coating has three layers that make the frying pan to keep its nonstick properties for longer. Tramontina fry pan will look good in your kitchen since it has a satin finish on its exterior. Its handle is also triple-riveted with stainless steel. The fry pan is versatile as it is compatible with ceramic, electric and gas cooktops. Cleaning it is very easy since it is dishwasher safe. Heavy gauge aluminum with nonstick interior. Oven safe up to 400 degrees Fahrenheit. Made of commercial grade 3004 aluminum. The nonstick interior makes cleaning very easy. The handle has a convenient hang-hole that you can use to store the frying pan in the kitchen. It is made in the USA and is NSF-Certified. Manufactured to withstand the rigors of a professional kitchen. Comes with clear care instructions. May lose its nonstick properties with time. 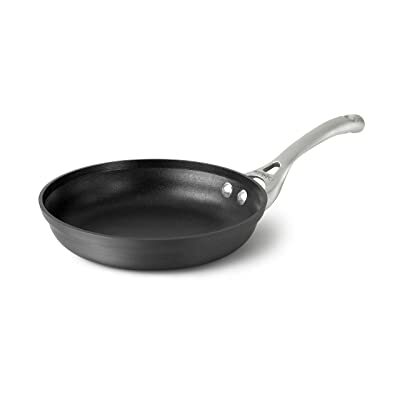 This fry pan is made from a heavy gauged anodized aluminum that is also scratch resistant. You will enjoy cooking using this fry pan due to the non-stick properties that make it possible for food to stick to its interior surfaces. You will also realize good results in your cooking due to the pan’s superior heat conduction. Its handles are made of riveted stainless steel that is coated with heat-resistant silicone. This will ensure that the handles remain cool even if the pan has been on the job for long. The design of this fry pan features German engineered unique rolled edges that facilitate drip-free pouring. OXO good grip cookware also has angled side walls that facilitate quick evaporation of liquids. Its round bottom also facilitates efficient stirring. Scratch resistant and heavy gauge anodized aluminum. 3 layer PFOA-free nonstick coating. Glass lids to allow you check the progress of your meal. It can be used on all types of stovetops except induction. Made of high-quality materials that meet the highest standards of cooking performance. The drip-free edges reduce spilling of sauces and soups. The handles are designed to stay cool to the touch. The pan may tip off due to its heavy handle. Scanpan Classic 9.5 inch is a nonstick fry pan that is made in Denmark. It features a PFOA-free ceramic titanium coating that makes it safe for use with metal utensils. This makes it very unique among nonstick pans since metallic utensils are a no-no with most nonstick pans. The pan is light and has a short handle. This makes it easy to maneuver while cooking in your kitchen. 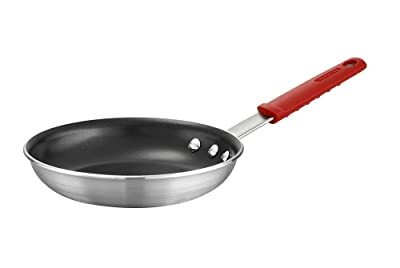 Its handle is very easy to clean since it has no rivets that connect the handles to the pan like most other fry pans. Due to its ease of cleaning and its scratch resistance surface, this Scanpan classic pan is an appealing purchase. The pan is versatile since you can use it on your stovetop or even in your oven to cook your favorite meals. It is also built to last and that is why it comes with a lifetime warranty to give you a piece of mind. It has a thick base that is designed to distribute heat uniformly to facilitate consistent cooking. It has silicone rimmed lids to give you a “clang-free” cooking experience. Takes a few minutes to heat. You can use metal utensils and they won’t damage its cooking surface. The pan is dishwasher safe. Cleaning is easy due to its nonstick surface. Is very expensive as compared to most nonstick fry pans. Why Should You Buy Nonstick Pans? Nonstick cookware comes with a lot of benefits. If you haven’t switched to a nonstick pattern, here are reasons why you should. Oil is a very important ingredient in the kitchen since almost all delicacies cannot be cooked without it. However, with a nonstick fry pan, it is possible to prepare your favorite delicacy without using a single drop of oil. This is because nonstick fry pans have nonstick coatings on their cooking surfaces that prevent food from sticking on their surfaces. Regular cooking utensils are very difficult to clean because they absorb a lot of oil when you are cooking. Nonstick fry pans, on the other hand, are very easy to clean because they do not allow food to stick on their surfaces. The nonstick coatings on the surfaces of nonstick pans also make them scratch resistant. However, it is extremely important that you only use the right utensils to avoid spoiling your pan’s non-stick coating. Most aluminum cookware that doesn’t have nonstick surfaces always look dull and unappealing especially if they have been in use for long. However, with nonstick fry pans, they will always look appealing due to their shiny surfaces. If you want the best cooking results and be able to cook faster, you need a frying pan that allows uniform distribution of heat. Nonstick fry pans ensure that food is cooked evenly and faster since they facilitate uniform distribution of heat. A good nonstick fry pan should be one of your most important pieces of cookware. If you want to purchase a nonstick fry pan, you should ensure that you get a decent frying pan that will improve your cooking experience. Here are important features of a good nonstick fry pan that you should look for. Design – The design of your fry pan really matters. You should go for a frying pan with a wide and flat bottom. This is because you want enough cooking room in the pan so that you don’t crowd the ingredients while cooking. A flat bottom also ensures that heat is evenly distributed on that pan so that the food is uniformly cooked. Handle – A long handle is good for a few reasons. A long handle feels sturdy to hold and also feels good in the hands. Since you will be moving your pan over hot burners, you want a handle that feels secure when you hold it. The handle of your fry pan should also be insulated so that it does not get hot when you are cooking. 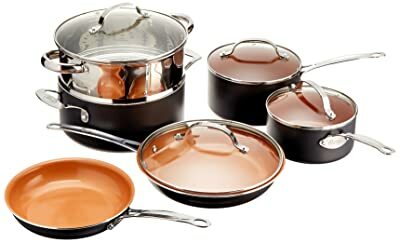 Materials – Pans are made from different materials that include copper, aluminum, cast iron and stainless steel. When choosing the best nonstick pan, go for one that is made of stainless steel or aluminum. This is because aluminum and stainless steel have the best heat distribution and are also easy to clean. Although nonstick patterns don’t allow food to stick on them easily, you will still have to clean them regularly. This is because grease and food residue can still stick on the easy to clean surfaces of nonstick fry pans. To remove grease and food residue from inside the pan, you will need dish soap, a non-abrasive nylon scrubber, warm water and vinegar. Here are simple steps on how you can remove food residue and grease from your nonstick fry pan. If the food residue or layer of oil on the cooking surface is difficult to remove, fill the frying pan with water and add half a cup of vinegar. The layer of oil and food residue will rise to the top as the mixture boils. Remove the oil layer and then dispose of the water. Use the nylon scrubber and wash the pan with warm water. Once you have thoroughly washed your fry pan until it is sparkling clean, use a soft cloth to dry it. There you have it on the best nonstick pans. You can choose the best one for you from our review list based on the features you love and your budget. When it comes to our pick of the best nonstick fry pan, we recommend Scanpan Classic 9.5 Inch Fry Pan. This is because of the ceramic titanium coating that makes it safe for use with metal utensils. Its nonstick surface also lasts the longest.